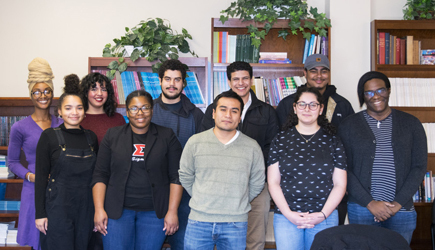 Mellon Mays Fellows at CCNY, front (from left): Chayanne Marcano, Victoria Juste, Josias Augustin Mendez, Jasmine Kasheboon Khoury and Jared Heron. Back (from left) Naajidah Aakitah Correll, Yasmine El Gheur, Brandon Latorre, Omer Alfalahi and Bryan Guichardo. Since 2001, support from the Andrew W. Mellon Foundation is credited for guiding more than a dozen talented City College of New York students from traditionally underrepresented groups to PhDs in the humanities and social sciences. With 17 more Mellon Mays Fellows from City College currently in doctoral programs, a new $70,000 one-year grant to CCNY brings this funding to approximately $2 million. Beneficiaries of this support include René Cordero and Vannessa Velez, both recently accepted to PhD programs in history at Brown and Stanford universities, respectively. Like their peers and predecessors, Cordero and Velez each won two-year Mellon Mays Undergraduate Fellowships from the Mellon Foundation while at CCNY. The MMUF program is designed to encourage the most talented students from groups traditionally underrepresented in graduate education as well as others committed to diversity in the academy to enter PhD programs and pursue careers in research and college teaching. “What sets Mellon Mays apart from other undergraduate research programs is that the Andrew W. Mellon Foundation provides financial and structural support to the fellows from when they are in graduate school to when they begin their careers as junior faculty,” said Isabel Estrada, Associate Professor of Spanish and Director of the City College Fellowships Program. This support comes in the form of dissertation proposal workshops for graduate students and book publication seminars for junior faculty, among others. Since the start of the Mellon Foundation-CCNY collaboration, 80 CCNY students have been awarded Mellon Mays Undergraduate Fellowships. Since 1847, The City College of New York has provided low-cost, high-quality education for New Yorkers in a wide variety of disciplines. Today more than 16,000 students pursue undergraduate and graduate degrees in eight professional schools and divisions, driven by significant funded research, creativity and scholarship. Now celebrating its 170th anniversary, CCNY is as diverse, dynamic and visionary as New York City itself. View CCNY Media Kit.